The stage is set for young gymnasts from all over the United States, who are going to take over Tampa during the 2014 YMCA National Gymnastics Championships, which will take place July 1 to 5, at the Tampa Convention Center and Raymond James Stadium. Although there will be hundreds of competitors coming from cities far and wide, the team from North Brandon will be Plant City’s closest thing to a true hometown team. And, it’s got at least two reasons why everyone in the Winter Strawberry Capital of the World should get ready to root for those girls. Representing the Greater Plant City area will be Kelsey Slone and Alessandra Cappucci, who hail from Plant City and Dover, respectively. These two young ladies are coming off solid performances at a mid-June AAU team tournament in Naples, winning first place in at least a few events, and look to carry that momentum into the first week of July. For Slone, these YMCA National Championships are her last chance of the season to get a perfect score — a feat she barely missed out on in Naples. Unlike some of her teammates, Slone, 10, is something of a late bloomer to the sport. She first entered the sport of gymnastics just two years ago, coming from a very different background. It didn’t take too long for the then-8-year-old to make up her mind. It was a natural fit. Slone picked things up quickly, with help from coach Tyna Papillon, and started entering competitions just this year. It’s easier to get Slone to open up about gymnastics than it is to get many other kids — older or younger — to talk about other sports. Her obvious love for gymnastics has helped her parents, who are big baseball fans, adjust to the transition. Kelsey will be competing in the bars, balance beam, floor and vault events but says the beam is her favorite. It’ll also be a shot at redemption for her, in a way: a small mistake cost her a shot at a perfect 10 at her last competition. Still, it’s a testament to the perfectionist nature of the sport. To make sure it doesn’t happen again, she’s been working on her routines for four days a week — a little over 12 hours — and has everything carefully mapped out in her mind. “I think I’m going to do good,” she says. While Slone is still fairly new to the sport, Cappucci is a six-year veteran. Her parents placed her and her siblings into several different sports from a young age, to see what would be the best fit, and the 9-year-old ended up choosing gymnastics over dance and soccer. 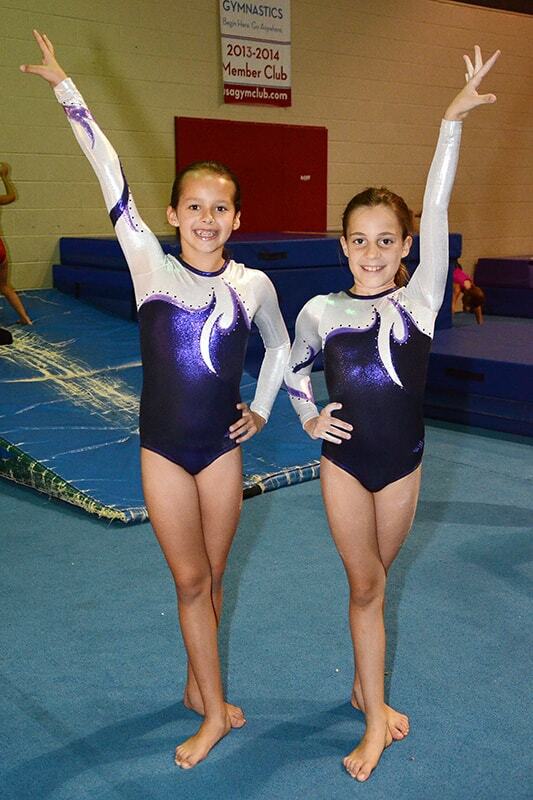 Having been a gymnast since age 3, Cappucci has been comfortable with the sport for a long time. Last season, she frequently scored nines and enjoyed a lot of success doing what she had always done. But, this season, a few things changed. At the Naples event, Cappucci took home five medals and, among other girls in her age group, placed third in the country in the vault event. True to form, she just focused on what drew her to the sport in the first place: having fun. Later in July, she’ll take a test to be eligible to compete in the uneven bars event starting next season. All she needs to be able to do is kip up to the higher bar — a skill she’s been working on and is close to achieving. Like Slone, Cappucci also will be competing in the bars, beam, floor and vault events in Tampa. She says she’s excited to be one of the Plant City area’s two representatives and hopes her hard work at the North Brandon facility will pay off. “I’m going to try to get nines on the bars, and all of the other events,” she says. Both girls also have something to look forward to in 2015. The next YMCA National Championships, which will be held in Kansas City, Mo., could be the first time the girls travel outside Florida to compete. It’s on their radars, but, for now, they both just want to go to Tampa and have fun and, hopefully, enjoy some success. The YMCA National Gymnastics Championships will be held from July 1 to 5, at the Tampa Convention Center and Raymond James Stadium, but competition doesn’t actually begin until July 3. Gymnasts from all over the country — a total of 20 states — will be competing against Kelsey Slone, Alessandra Cappucci and the rest of the North Brandon team for gold medals. For more information about the event, visit ymcagym nationals.org.